In an unnamed city, in a hotel’s lobby, a group of frightened souls seek refuge from the falling bombs illuminating the night outside. On a calm, fog-shrouded night in either another city or at another time a woman walking a dark street accidently brushes against a stranger and within moments has his deformed hands choking the life from her. Down the rabbit hole falls Alice. Now either the hole is very deep or she’s falling very slowly… Thus begins Len Jenkin’s Margo Veil now having its West Coast premiere at the Odyssey Theatre Ensemble in Santa Monica. 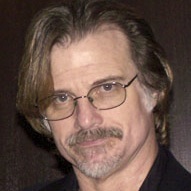 Jenkins has drawn his inspiration from a dizzying cluster of sources: Film Noir, David Lynch, Hitchcock’s Strangers on a Train, Lucille Fletcher’s radio drama The Hitchhiker, Lewis John Carline’s Seconds, evangelical Christian radio preachers, Charlie Kaufman’s Being John Malkovich, the musical theater of the 1930’s and the writings of Lewis Carroll. Jenkins’ Alice is Margo Veil, an actress who finds herself broke when the show she was playing the lead in flops after opening night. When offered five hundred dollars to accompany a coffin being transported by rail for burial out West, she agrees. This train, as it flies through the murky night, becomes Margo’s rabbit hole in which genre styles and time periods, characters and narratives all overlap and repeat, echoing and counterpointing one another with a dreamlike abandon reminiscent of Escher’s Relativity. Bulging with murders, mysteries, escaped lunatics, Latvian folk songs, sinister idols, seductions, dance numbers, homicidal amnesiacs and lecherous magicians, the play’s story line is more a story web, but one which director Bart DeLorenzo weaves with superlative skill. This is a co-production between the Odyssey and the Evidence Room Theatre, which the majority of the cast are members of, and where DeLorenzo is artistic director. The players succeed in dominating the tumultuousness of the playwright’s material as well as thoroughly engaging the audience by their dynamic and adroit performances. In an ensemble of standouts there were those who stood out further: Dorie Barton as Margo Veil, Tom Fitzpatrick as Reverend Ford, Brittany Slattery as Alice, and Don Oscar Smith as Hepstein. With Beth Hogan producing, the formidable expertise of the Odyssey’s creative staff has served the production well. Keith Mitchell’s set is grand, the lighting of Lap Chi Chu combined with John Zalewski’s dexterity as sound designer affect the multiple locales and time shifts seamlessly. Ann Closs-Farley also deserves kudos for costuming the actors with such flair in denoting the distinct varieties of period and nationalities that their ever changing roles demanded. Margo Veil might not appeal to some. If you like to leave the theater with the satisfaction of knowing what it was “all about,” and are most contented when all the “t’s” and “I’s” are crossed and dotted for you, then this might not be the show for you. If however you like your theater without a net, are addicted to crossword puzzles, and your favorite part of play-going is sitting at some little café afterwards discussing the actual meaning of it all, then raise your seats to their upright position, fashion your seat belts and enjoy Margo Veil. Wednesday* through Saturday at 8:00 p.m.; Sundays at 2:00 p.m. CLOSES: Sunday, July 31 at 7:00 p.m.
“Pay-What-You-Can” (min. $5.00) on June 16, 17, 26 and July 13.